1. 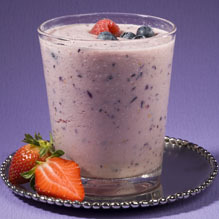 Place Real California Milk, berries, sugar and cinnamon in blender or food processor and puree for 1 minute. 2. Add ice cubes and process until smooth and frothy. Serve immediately.